Freeway truck accidents in Los Angeles are much more frequent than many other parts of the country. As an attorney that represents victims of these crashes, I know that driving on our L.A. freeways, can be risky especially with the amount of traffic occupying major highways such as 710, 605, 60, 91, 57, and 5. These routes accommodate thousands of vehicles and trucks on a daily basis. Evaluations of well known accident prone areas are being investigated to develop strategies to lower the number of accidents which occur yearly in these areas. Although able to hold massive amounts of vehicles everyday, accidents occur due to the negligence of drivers. While car accidents are commonly seen on numerous U.S. roads, the number of freeway accidents in Los Angeles are quickly increasing as well. In fact, according the statistics from the California Highway Patrol, there are four stretches of freeway in Los Angeles and the Inland Empire that have more truck accidents annually than any other place in the Golden State (710 at the 60 in the East L.A. Interchange; the 710 between the 105 and the 91 freeways; the area where the 60 and the 57 freeways converge; and between the 710 and the 10 freeways, also in the East L.A.). Sometimes these disruptions are caused by lack of courtesy or awareness of the exact proximity one has to drive within reasonable limits, and other reasons are simply related to speeding. 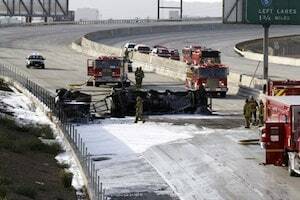 Some of these freeway accidents involve the expulsion of dangerous chemicals which also can also pose fire and health hazards. If a fire does occur and is not contained within a short period of time, the potential of affecting numerous drivers can quickly increase. Although plans are underway to improve highway safety, concerns about daily accidents are still prevalent. There’s no doubt that car accidents have major impact on drivers and passengers, but truck accidents can have an even more devastating effect on both the motorist and truck driver. Depending on the extent of damage to the vehicle and if there are any survivors, injured persons may have to deal with a lifetime of suffering. This is due to the weight of the truck and the amount of cargo that is being transported at a high rate of speed. Additional impact factors include crowded lanes, deteriorating ramps and overpasses amd weather conditions. Drivers of trucks and cars may assume that they’re driving safe, but the aftermath of an accident will often reveal the carelessness of one or both drivers. Sometimes these accidents can cause multi-vehicle pileups and traffic will be held up for miles. A recent news report revealed that the number of truck accidents are also impacting the state’s economy. This is due to limited monetary resources that are available to repair the highways in the state. As a result, the probability of more accidents are likely to occur. The implementation of a fund that is specifically designed to hold transport businesses responsible for the cost of highway repair is awaiting approval. If the government approves the proposed legislation, the collected funds will cover the weight and cargo of trucks. If you were injured in a truck accident on one of Los Angeles’ highways, you can seek legal assistance to help with the expenses that you have accrued as a result of the accident. Since you can’t predict how long it will take you to recover, you should submit a claim for benefits to your insurance company. However, if your insurance company denies your claim, you should contact a personal injury attorney who can represent you and pursue benefits on your half. Lost wages – During your time off work you can collect compensation to cover your lost income. Rehabilitation Services – These services include physical therapy, occupational therapy, and speech therapy. Attendant Care Services – These services are available if you require assistance with daily chores and personal care. Medical care – Benefits include coverage for office exams, tests, procedures, and treatment. Pain and suffering – The impact of a truck accident can also affect your mind and emotions. Although it may take some to fully recover, compensation can help reduce the stress associated with this type of accident. Depending on your length of recovery and the extent of your injuries, the pursuit of benefits are critical because medical expenses can increase rapidly. You can also seek legal assistance if had a loved one pass away because they were killed in a truck accident. Legal provisions have been made to help a victim’s surviving family members. This is due to the loss of companionship and income that the victim provided prior to their death. A personal injury attorney can help protect your legal rights or the legal rights of your deceased loved one. However, in order to receive these benefits you must not delay your request for help. The sooner you seek help, the greater the likelihood will be that you can reduce your out-of-pocket medical expenses. If you’re uncertain about what steps you should take to file a personal injury benefit claim or have been denied benefits, contact a truck accident attorney in California today.